Nikolaikirche in Leipzig was the centre of the peaceful public revolt against the communist system in East Germany. Beginning in 1980, people gathered in the church every Monday for prayer. First just a few met, then more, until in 1989, thousands came together there every week for Monday mass, which was followed by a walk of protest. Dorothee Lang is a writer, web freelancer and traveller. She lives in Germany and edits BluePrintReview and Daily s-Press. Recent publications include HA&L, YB, elimae, Referential, a handful of stones, eclectica, and for a silly reason, The New Yorker. For more about her, visit her website. great to be joining “The Crowd”. and a good match in time it is: last sunday was the 20th anniversary of the german reunion. 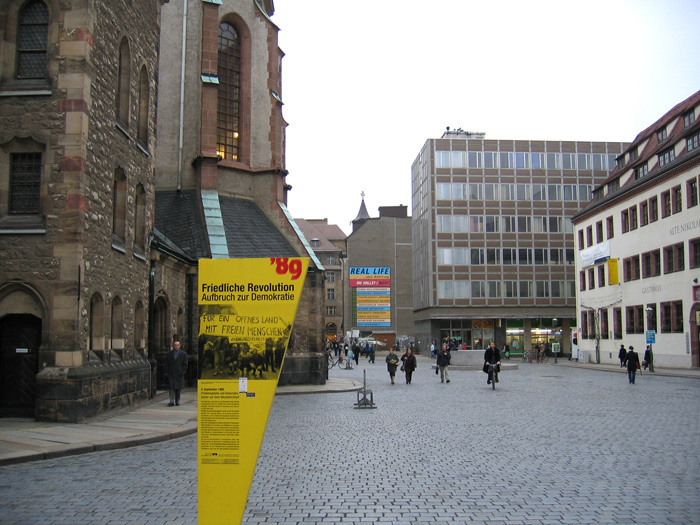 it’s still a little miracle, that all this happened in peaceful ways in 1989, and in 1990. looking at other places of public protest, Nikolaikirche could also have turned into an equivalent of Tiananmen Square.